I think the title of this post begs a short dance party interlude. One of today’s challenges is finding a good rhythm for work, family, and play. For me, this includes involving myself in my kids’ academic, sports, musical, and scouting activities. A highlight in my life’s dance has been serving as a mentor to our community’s middle school Science Olympiad team. It’s hard to explain all that Science Olympiad is. To give a quick sense of scope, it takes between 100 and 300 volunteers to run one tournament. Our Hudson, Ohio high school and middle school teams attend about five tournaments each year. 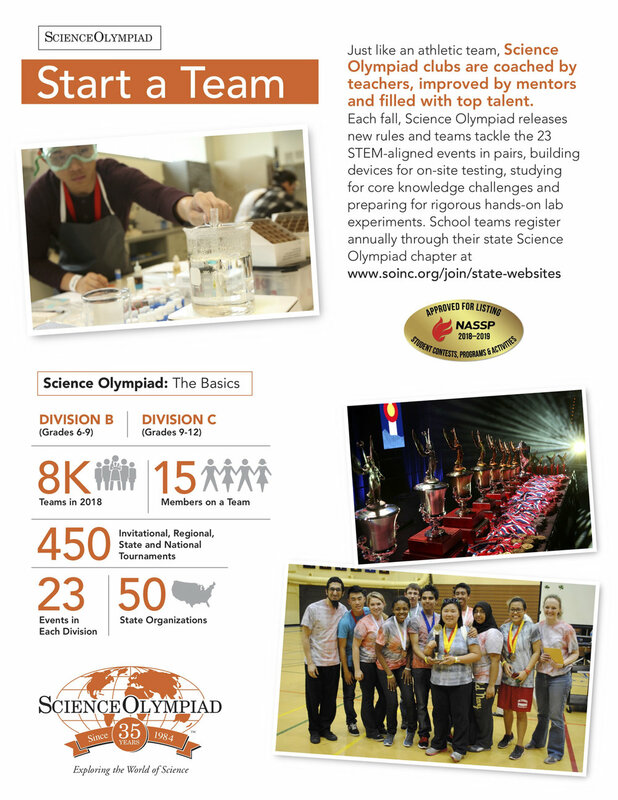 Nationally, there are about 8,000 Science Olympiad teams from all 50 states that compete in over 450 tournaments each year, leading up to an annual national tournament, which will be held this year, 2019, at Cornell University. Tournaments bring together between 20 and 70 teams of fifteen students each. 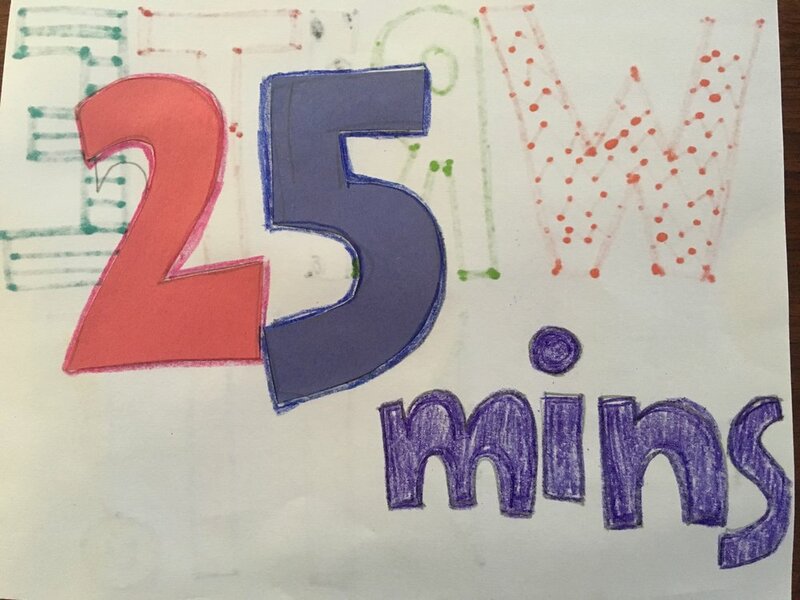 These fifteen teammates then break into groups of two or three to compete in 23 different events that are run in concurrent blocks — like a track & field meet — and cover a wide range of science topics. A list of this year’s events are shown below. The two-person WIDI team works together for 50 minutes to recreate the device. To start, WIDI Player #1 —the Writer — goes into the room with the models, while WIDI Player #2 — the Doer — is sequestered in a different space. For 25 minutes, using paper provided by the Event Supervisor, the Writer hand-writes instructions on how to build the model. 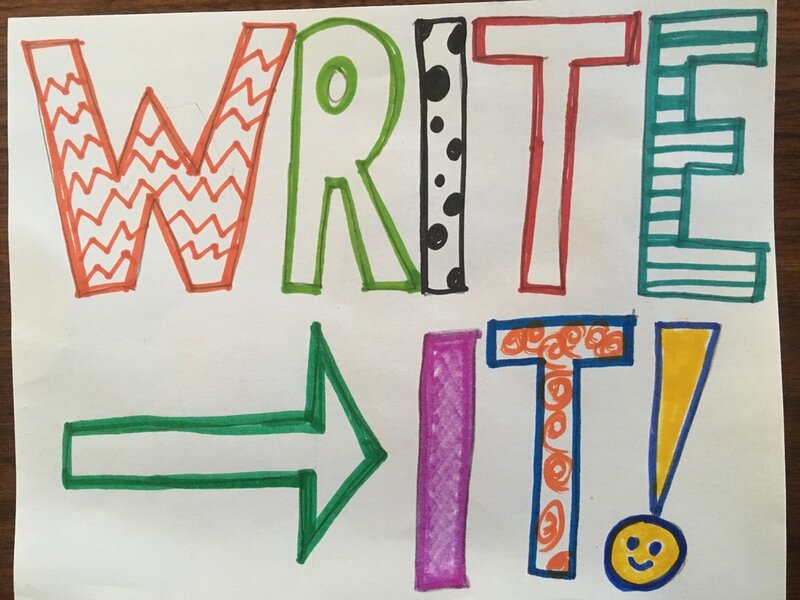 When time is up, Writers are excused and focus shifts to the Doer. Without any interaction between partners, the Writer’s instructions are then given to the Doer, who then has 20 minutes to build the device from a kit of supplies provided to them by the Event Supervisor. If there was a foaming-at-the-mouth-with-excitement emoji, I would insert it here. 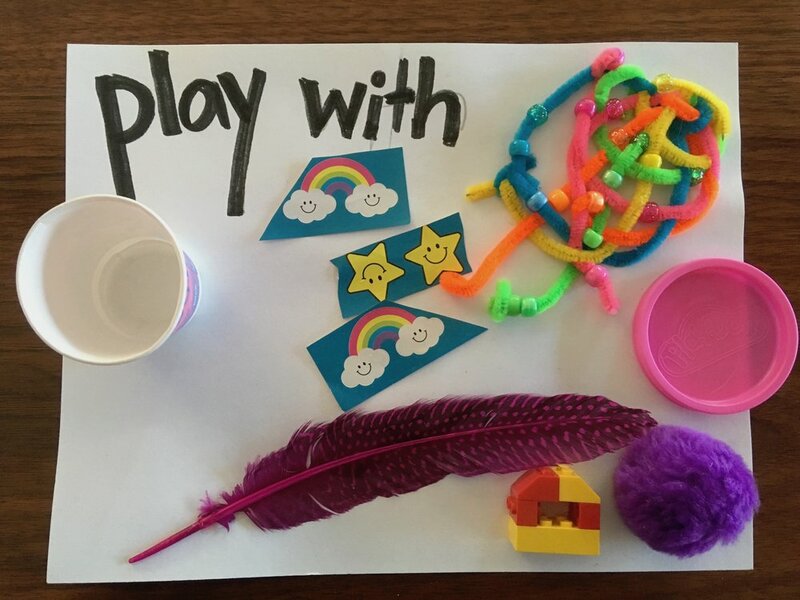 As I have previously shared, one of the lasting legacies of my time as a professor at UML is the freedom and depth I’ve brought to my evaluation practice by introducing materials I loved as a kid — like colored markers, stickers, pipe-cleaners, beads, and buttons — into participatory activities with my clients, who are creative and generous and skilled and committed to preventing violence. After I left UML, but before I discovered Science Olympiad, I came upon the maker movement in Cleveland. It was six years ago today, actually, that I participated in the first Mini Maker Faire in Cleveland Ohio. I ran a couple workshops in which participants introduced themselves by sharing one “thing” on their person (e.g., a scarf, a keychain, a hair ribbon) and got warmed up with an exercise I’ve adapted from the world of improv and a parlor game I learned as a foreign exchange student in Copenhagen Denmark circa 1987. Then, I pulled a song title with the word LOVE in it from a hat, everyone modeled it from crafty materials, and we used their creations to discuss what LOVE is/means/looks like. Check out photos 8263, 8265 8268, 8271 here to see some of my very fabulous participants, including my dad, Al Wasco, playing along. At that time, I thought that Mini Maker Faire workshop was a great way to pull together my life experiences and share them with others. I again have that feeling of purpose, that my whole life has brought me to this task. It has been a joy to apply my teaching, coaching, encouraging others to problem-solve with random bits of crafts and words; to grow my evolving skill of managing the energy and brilliance of middle schoolers; and to combine all that with a love of SCIENCE, and TEAMWORK, and COMPETITION. Watching our community, and so many others across the country, come together to support the next generation of scientists is one of my strongest post-2016 sources of hope and inspiration. This year, our Hudson high school and middle school teams both qualified at the regional tournament to advance to our state competition, held at the end of this month at the Ohio State University. My two sons earned spots on their respective teams! Both have been slated to compete in WIDI! Each of them will be working with a friend, to write and do — faster and more better (fingers crossed) — than most other kids across the state. I am impressed by the curiosity, collaboration, and perseverance I’ve witnessed since becoming involved in Science Olympiad. I’m looking forward to April 27th; and have already begun planning my training sessions for next year’s WIDI team. 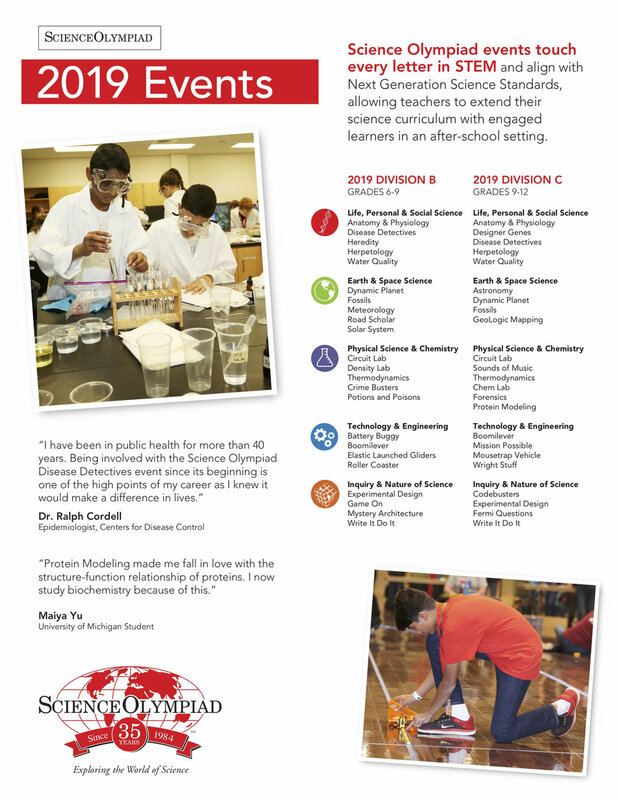 This hand-made poster — along with the others shown throughout this blog post — is one of the visual aids I used to introduce and explain the WIDI event to prospective Science Olympiad students at the beginning of the 2018-19 season. Sep 14 Commitment to collaboration guides my work.